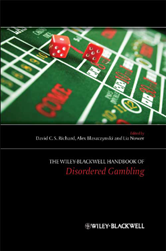 This comprehensive handbook provides a complete guide to the current empirical literature relating to the conceptualization, assessment, and treatment of disordered gambling. The distinguished list of international contributors are all experienced, practicing clinicians who discuss gambling as it occurs around the globe, and chapters cover a diverse array of contemporary topics in the field. Who is a disordered gambler? Where Will Prevalence Rates Go From Here? What is going on in your brain when you gamble? What Has Been Done to Reduce Harm and By Whom?